The DFX II Series is a low cost digital force gauge, ideal for applications where the user is interested in basic peak force measurement. This digital force gauge is available in 10 lbf, 50 lbf, 100 lbf and 200 lbf. Loads are displayed in ozf, gf, lbf, kgf, and N units and can be set up to display data in a range of languages. 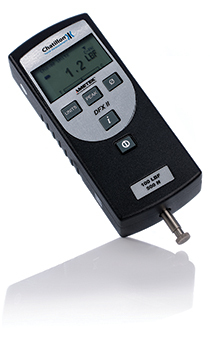 The Chatillon DFX II Series is a low cost digital force gauge, ideal for applications where users are interested in basic peak measurement, such as the force necessary to depress a button. Attached to an MT test stand, this digital force gauge can measure the maximum tensile force applied before a cap comes off a spray can. Used with the optional pistol grip attachment, the DFX II can measure the force necessary to open a door. This digital force gauge features an integral load cell with a measurement accuracy better than 0.3% FS. A large, easy-to-read, high resolution dot matrix LCD display supports a variety of standard gauge functions including normal peak reading. Selectable language displays and calibration procedure are included in the digital force gauge setup. Expand the functionality of your DFX II force gauge even further with the advanced ForceTest software. Find out which adapter you need for your DFX II digital force gauge in this Connection Diagram. Find the Declaration of Conformity for the DFX II Series force gauge here. Firmware Version 1.05 06-Jun-11. Updated model details in the firmware.